I absolutely love fudge but a lot of the recipes that I have tried from around the internet just did not ever seem to work. The fudge would go grainy or not set or similar. I used to make fudge as a kid and I was sure there was a simpler way. So I went back to my roots and back to my Carnation sweetened condensed milk and finally made the perfect fudge. This fudge is so easy to make I wonder why I waited so long to go back to this way of making it but I’m so glad I did. It’s a bit soft so not too hard but if you don’t store it in a sealed container it will go rock hard. I also suggest cutting it up before it cools too much. 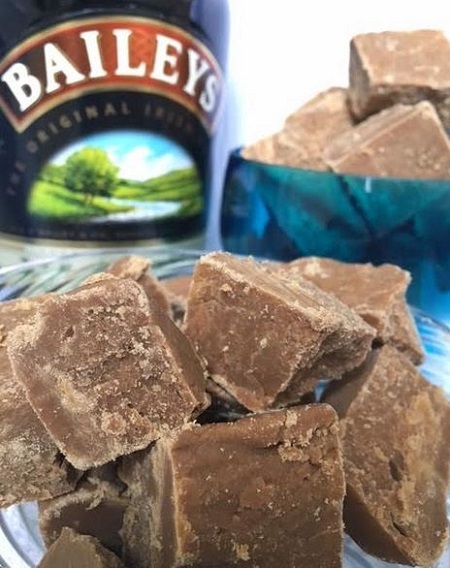 While this is not white chocolate baileys fudge, it is so gorgeous I think it is better without any chocolate. I’ve also recently experimented with a super simple chocolate fudge so I’ll blog that recipe later! I strongly recommend using a candy thermometer. Prepare a 20×20 tin with parchment paper. Put all ingredients into a non-stick pan that is very large. Large enough that when the mixture bubbles up, it won’t bubble over. Melt everything together over a low heat, stirring constantly until the sugar dissolves in the Bailey’s and melting butter. If the heat is too high you risk burning the sugar. Increase the heat and bring the mix to the boil while stirring constantly. Reduce the heat to a simmer and scrape and stir the mix constantly as the temperature increases. Do not let the bubbling sugar mixture touch your skin! Boil until it reaches the soft ball stage. This is 118C and is when a soft ball of fudge is formed when dropped in ice cold water (sugar thermometers by Tala are available at Tesco, Amazon and John Lewis). Beat with a wooden spoon for 8 – 10 minutes. This is extremely important in order to get a smooth and complete set. If you beat it less (like I once did) it goes grainy and doesn’t set smooth. It will change in appearance but I used a timer to check. After beating, pour into your prepared tin lined with parchment, smooth to an even thickness and let it cool and set. Cut into small squares and enjoy! Store in an airtight container.